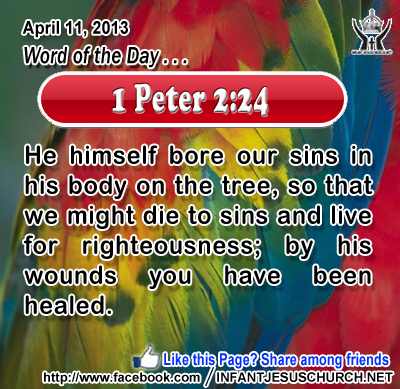 1 Peter 2:24: He himself bore our sins in his body on the tree, so that we might die to sins and live for righteousness; by his wounds you have been healed. Heavenly Father, how you could stand to see your precious Son under the weight of our sin, all sin, we will never understand. Thank you for such great love and for being so great God. There is none who can be compared to you, O God. Your greatness is beyond imagining and your love beyond our dreams. We will live today to your glory through Jesus who bore our sin so we could be your child. In the precious name of your Son we pray. Amen. 23In that day you will ask nothing of me. Truly, truly, I say to you, if you ask anything of the Father, he will give it to you in my name. 24 Hitherto you have asked nothing in my name; ask, and you will receive, that your joy may be full. 25 "I have said this to you in figures; the hour is coming when I shall no longer speak to you in figures but tell you plainly of the Father. 26 In that day you will ask in my name; and I do not say to you that I shall pray the Father for you; 27 for the Father himself loves you, because you have loved me and have believed that I came from the Father. 28 I came from the Father and have come into the world; again, I am leaving the world and going to the Father." Heavenly Father, your love knows no bounds and your mercies are new every day. Fill us with gratitude for your countless blessings and draw us near to your throne of grace and mercy. Give us confidence and boldness to pray that your will be done on earth as it is in heaven.